Belote - thanoscardgamess jimdo page! 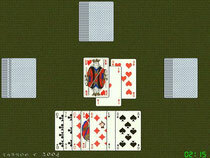 This game plays tournament Belote. Belote is one of the most popular card games in France, although it has been known there only for about 70 years. Players form two teams of two partners. Before playing there's a bidding to determine trumps. Cards in the trump suit both rank and score differently from those in other suits. There is actually a promotion of the trump 9 and J. The team that selected trumps must make at least the points of their opponents to win. Points are gothered by capturing specific cards and by declarations. Such a declaration is Belote and Rebelote, which are the trump King and Queen held together in one player's hand. You have the option to select among three french-suited card decks.